Our Oakville Chiropractor Dr. Jenn has been talking a lot about the benefits of acupuncture in Oakville on this blog lately. Are you curious what a total acupuncture treatment might look like? Let’s discuss it. 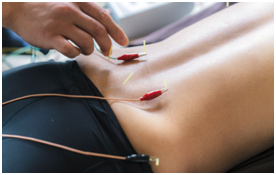 Acupuncture needles can be inserted at a number of locations in the body to help improve your function and decrease your pain. Some of the needle locations might not seem to make sense, but let’s discuss why they do! For the purposes of this blog post, we will use the example of a hamstring strain and how it can be treated using acupuncture. To start – there is the direct approach. Your acupuncture provider can pop needles right into the sore muscle. If this muscle is pulled or torn, the needles can stimulate the healing of the tissues and can have an immediate effect on the pain. If the muscle is in spasm, the needle can help alleviate the tension and help the muscle relax. The next area that a practitioner might choose to insert needles is along the spine. But why would our Oakville Acupuncture team do this? Each muscle/tissue is innervated by one or more spinal segmental nerves. For the hamstrings, our lowest segments provide the innervation (right at the very bottom of our spine before it meets our pelvis). By targeting the nerves right after they exit the spinal column we can have an effect on the muscle. Isn’t that cool?! But wait, now the practitioner is putting needles at a different level of the spine. We just discussed that the segments responsible for moving the hamstrings are at the base of the spine, but these needles are being inserted at a higher level? For a lower limb problem the Chiropractor can insert needles into the mid-lower levels and impact the efficiency of the blood flow to the injured area. By stimulating and promoting blood flow to the injured area we can promote healing. Increasing the blood flow to the area increases the nutrient supply that helps tissues heal. You would be surprised how significant an impact this can have on your recovery! Your Chiropractor might also choose some more traditional acupuncture points that can have a global effect on your pain. For example, there are 4 points that are strong pain relievers – two points in the hand, and two points in the feet. For a lower limb injury the practitioner might choose to include the foot points, and for an upper limb condition, they might choose to include the hand points. In Traditional Chinese Medicine these points are known as ‘The 4 Gates’ and are strong pain killers. Additionally, there is a point in the outside of the lower leg that is great to helping relieve any type of musculoskeletal pain. There are various other interesting points in the body that are known for alleviating other symptoms including menstrual dysfunction, stress/anxiety and nausea. Lastly, there are some wonderful acupuncture points in the ear that can have a system-wide effect on your body. It sounds weird, but trust me and give them a try! These points can help manage anxiety and depression, improve mood and help dampen an overactive system that often occurs when we are in pain. With these points, we use smaller needles to make insertion painless. Can you tell I love acupuncture? There are so many options within an acupuncture session that can help make the treatment effective. If you’re curious if acupuncture can help you, visit me (Dr. Jenn) at Nottinghill Family Wellness or call 905-827-4197.